Earning congratulations from the entire Paulding community, Caleb Hutchinson will treated to a parade Tuesday evening in Dallas at 6pm. The festivities start at 6:00pm, beginning with a Parade starting at Hardee Street, coursing down Main Street and ending at the historic Paulding County Courthouse. 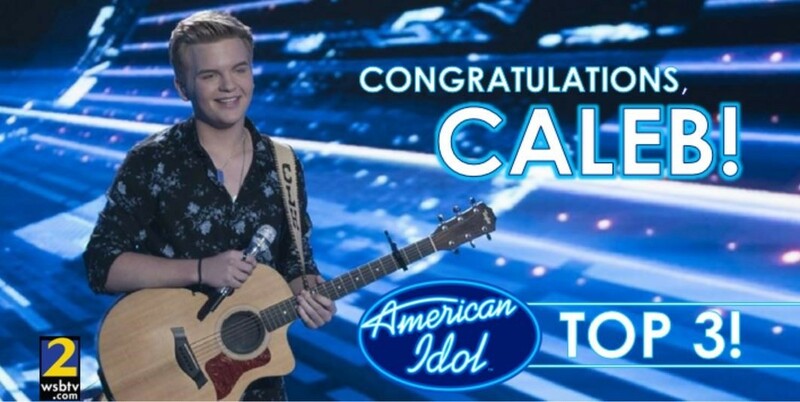 Caleb will then perform a concert for his fanswho helped vote him into contention as the 2018 winner of the American Idol competition. American idol will be filming the parade, concert, and festivities, and will feature clips on American Idol, this coming Sunday - May 20th. (Paulding County, GA) On Wednesday April 11, 2018 at approximately 5:04 AM Paulding E-911 received a call from the residents at 519 Dallas Road Dallas, GA reference shots being fired into the residence. When Deputies responded to the scene they located a female victim who suffered from a gunshot wound to her lower extremities. The female victim was subsequently transported to a local hospital with serious injuries. Detectives indicated that it appeared as if multiple shots were fired at the residence from the area of the road and then the shooter(s) left the scene. Detectives encourage anyone who may have any information, or who may have seen the suspect(s) or the suspect vehicle, to call the Criminal Investigations Division of the Paulding County Sheriff’s Office at (770) 443-3015. (Paulding County, GA) On Monday March 12, 2018 at approximately 8:04 AM a 911 call was placed to Paulding E-911 regarding a body that was located on the side of the roadway in the area of Pleasant Grove Road and Majesty Drive which is in western Paulding County. Once Deputies and first responders arrived on scene they quickly discovered that the male was deceased. After a canvas of the area, it was discovered that the male victim lived at a residence in the area. According to Detectives and a preliminary examination by the medical examiner at the Georgia Bureau of Investigation Crime Lab in Atlanta, the injuries that the male sustained were consistent with that of a self-inflicted gunshot wound to the head. The victim has been identified as a 15 year old white male and contrary to some false reports, the victims hands were not bound behind his back. Due to the fact that the victim is a juvenile, we will not be releasing his name or the school he attended. Prior to first responders arriving on scene, it was reported that a Paulding County school bus passed by the scene and some students may have seen the victim lying in the grass beside the roadway. The Paulding County School District is working with the affected schools and students to help them cope with what they may or may not have seen. It must be noted that there has been some speculation from certain individuals and sites on social media regarding this incident. The Paulding County Sheriff’s Office is a professional law enforcement agency that conducts all of the law enforcement operations for unincorporated Paulding County. We would encourage everyone, who wants factual and accurate information, to trust our website, press releases, and social media sites and not share and follow sites that post inaccurate and false facts about incidents that occur in Paulding County. The Sheriff’s Office disseminates information to the public when it is appropriate, factual, and at a time that does not hamper or hinder an investigation. We do not always have the luxury of making quick statements in cases like these that may not be factual just to appease a certain site or group of individuals. At no time during this incident did Deputies or Detectives feel as if the public was in danger. Teen suicide is a grave problem in the United States and should be taken seriously. If you, or someone you know, is struggling with suicidal thoughts, substance abuse, depression, or any other ailment which might lead to suicide, please get some help as soon as possible. If you need help you can call the Georgia Crisis Access Line at 1-800-493-1932. (Dallas, GA) – The Paulding County Emergency Management Agency (EMA) is currently recruiting Volunteers for the Community Emergency Response Team (CERT). CERT Volunteers work together in teams often times assisting with missing persons searches, shelter operations, SkyWarn storm spotter participation, conducting damage assessments following significant weather events and providing logistical support with planned community events such as fireworks displays and parades. The CERT Program is managed by the EMA which provides training and equipment to active members. All applicants must be 18 years of age. Anyone that is interested in volunteering with our CERT Program may contact EMA Coordinator Stephen Dooley at 678-383-3421 or E-mail sdooley@paulding.gov with any questions and to be placed on the training list. Applications may be picked up at the Fire Administration Office located at 165 North Johnston Street, Dallas, Georgia Monday through Friday 8am to 5pm or at the Emergency Operations Center (EOC) located at 1389 Industrial Blvd. North, Dallas, Georgia Monday through Friday 8am to 5pm. Please note that the EOC is closed to public between noon and 1pm. Paulding County EMA began utilizing volunteer members with the CERT Program in 2016 and has found the program to be very successful and an enhancement to the Preparedness, Response and Recovery goals of the Agency. FEMA and GEMA provide Homeland Security Grant funding assistance for the establishment and sustainment of the program. CERT is a positive and realistic approach to being ready for emergency situations. CERT emphasizes sound decision making, rescuer safety and doing the greatest good for the greatest number of people. (Paulding County, GA) On Monday March 5, 2018 at approximately 12:16 PM Paulding County E-911 advised that the Haralson County Sheriff’s Office was in pursuit of a stolen white Toyota Tacoma truck on GA SR 120 West traveling towards Paulding County. Paulding E-911 further advised that shots had been fired at some point during the incident. Paulding Deputies immediately traveled to the western side of the county to try and assist with the pursuit. Once Paulding Deputies observed the vehicle on GA SR 120 West (Buchanan Highway), they noticed that it appeared to have had its back glass shattered and possibly shot out. They also noticed that it had sped away from the Haralson County Deputies and it was traveling at a high rate of speed by itself, making it dangerous for other motorists on the roadway. Paulding Deputies immediately activated their emergency equipment and pursued the suspect vehicle. During the Paulding portion of the pursuit, Deputies were able to sucessfully deflate one of the suspects tires utilizing “stop-sticks”. The pursuit continued on for several miles but the truck gradually slowed down as the tire began to disintegrate. Eventually the truck turned onto Old White Oak Church Cemetery Road where it drove through a homeowner’s yard and ultimately onto the back of their property where it crashed into an embankment and a tree. When the suspect exited the vehicle he was apprehended by one of the Sheriff’s Office canines. A short time later, he was taken into custody by the Paulding Deputies and Georgia State Patrol Troopers who were on scene. Deputies immediately called for Paulding Fire/Rescue and MetroAtlanta Ambulance to examine the suspect for the canine apprehension and what appeared to be a gunshot wound to the arm. The suspect was eventually transported to Kennestone Hospital where he was treated for his injuries. It must be noted that there were no shots fired during the Paulding portion of the pursuit. Once Paulding Deputies began speaking with Deputies from Haralson County, Troopers from the Georgia State Patrol, and Deputies from Cleburne County (Alabama), they began to get a better understanding of what took place during this multi-state incident. According to Deputies with the Cleburne County Sheriff’s Office (Alabama), this incident began when a report was made that a GMC Yukon SUV was stolen. Shortly after the theft, Cleburne Deputies spotted the stolen vehicle and that is when the pursuit began. The chase traveled into Georgia where it went through Carroll County and eventually into Haralson County. Haralson County Deputies indicated that the suspect crashed the stolen GMC Yukon somewhere in Haralson County and fled on foot. The suspect then broke into a home where he took keys to another vehicle (white Toyota Tacoma truck). That is when gun fire allegedly erupted between law enforcement officers and the suspect. In the midst of that gunfire, the suspect fled again and that is when he traveled into Paulding County where Paulding Deputies intercepted him. The Georgia Bureau of Investigation is looking into the officer involved shooting aspect of this case. The suspect has been identified as Donald Brandon Hamner (W/M, 25 YOA), of Coker, Alabama. Hamner was released from Kennestone Hospital later later in the day on March 5, 2018 where he was transported to the Haralson County Jail. Hamner will face multiple charges in several jurisdictions as a result of this incident. (Paulding County, GA) Hiram High School Student Layla Deshaun Njie (B/F, 17 YOA), a junior, was arrested and charged with Terroristic Threats (Felony) This is the third, possibly fourth arrest of local youths who apparently thought it cute to write threats of shootings on walls, out loud and on social media. This particular came to light when Deputies were speaking with students about a threat on social media when they were alerted of a possible school shooting threat that was made on a Paulding County school bus on Wednesday February 28, 2018 during the afternoon ride home. Deputies, working in conjunction with Paulding County School District administrators, obtained the video from the school bus and confirmed that a female student stated multiple times that she would “shoot up the school” using some expletives and other inappropriate language. The threatening messages reported on social media account regarding a school shooting that was investigated at Hiram were determined to pertain to an incident that took place in Polk County on Thursday March 1. Polk County Schools were placed on lock down for a threat. Once it was determined that these posts were not threats against a school, they were removed from the social media platform they were posted on. Authorities are disturbed at the number of incidents, none of which can be ignored. As we have been saying all week, if a student makes a threat and we can prove its validity, we will make an arrest and charge that student with the corresponding crime, said PCSO spokesman Ashley Henson. Parents, please have a serious and candid discussion with your children about the severity of making these kinds of threats whether they are made in a joking manner or not. Making threats to harm students at a school is NOT A JOKE. Since the individual in this case is 17 years old, we would like to make a point of clarification to our citizens about juveniles and how they are charged with criminal offenses in the State of Georgia, Henson said in a release. In the State of Georgia a juvenile is considered to be anyone under the age of 18. However, and this is something that most people do not understand; an individual can be considered to be both an adult and a juvenile at 17 years old. If a 17 year old commits a “status offense” they would be subjected to the penalities and sentences of the Georgia Department of Juvenile Justice and the Juvenile Court System. Some examples of status offenses are runaway, truancy, disorderly.